At the end of March, I finally signed up for my free month of membership at the new Big Picture Classes site. This month I'm working through some of the classes, exploring the site, earning badges, posting projects, and checking things out to decide if I want to continue with a membership after my free trial. I started in right away with a scrapbook class - Paige's Pages. This class offers four lessons, each with INSPIRATION and a challenge to use our supplies in a new way. 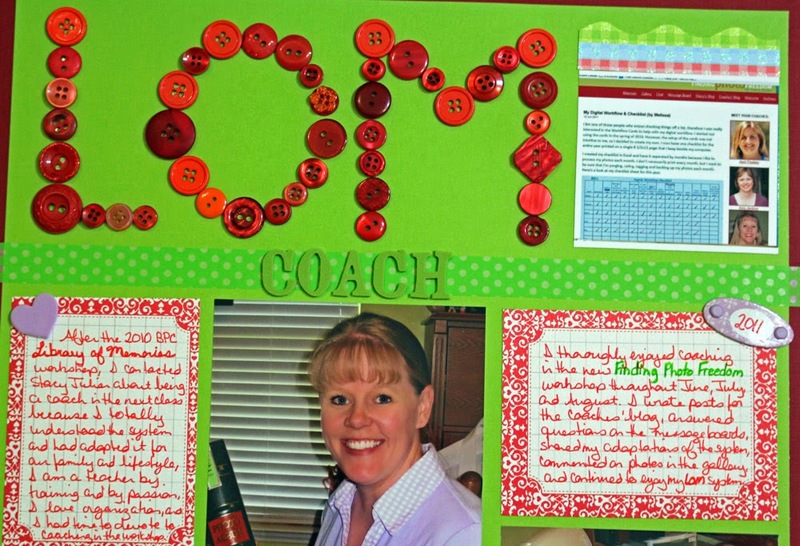 The first lesson was all about using 20 of something on a page, and Paige Evans' layout used one small photo and 20 plus buttons to cover water-colored letters (LOVE) that filled a 12x12 page. 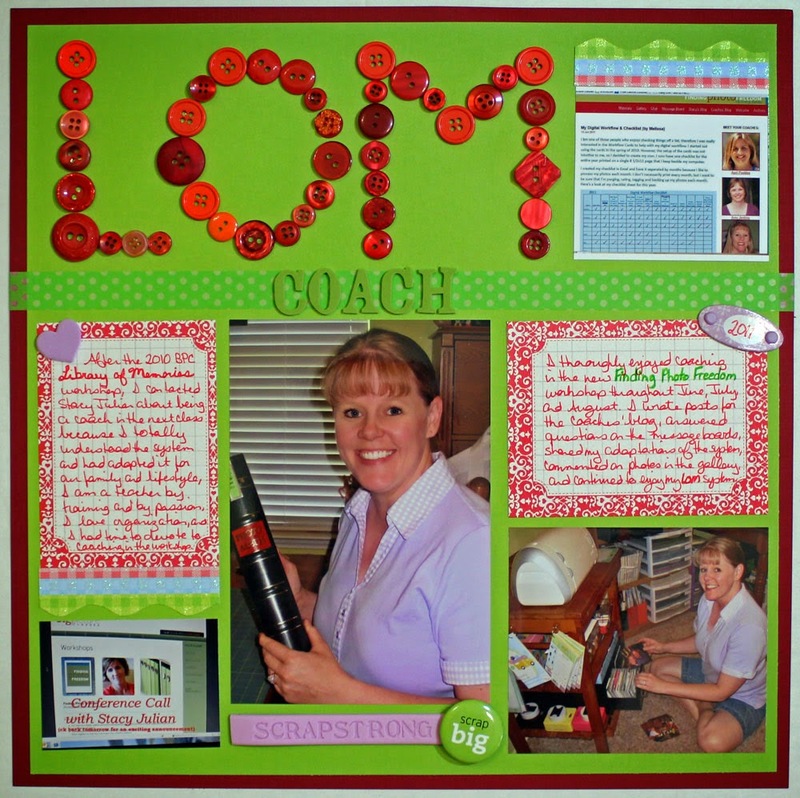 At first I wasn't inspired to do a large word on the page, so instead create my title using buttons for this layout about my first year as a coach in the Finding Photo Freedom workshop. 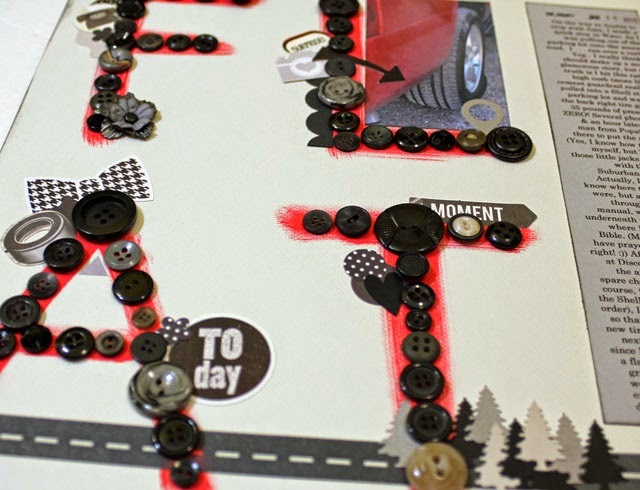 It was FUN using buttons in a variety of sizes, colors and shapes! A few days later, I was inspired to try Paige's approach with large letters covering most of the page. I printed my journaling for this layout from this blog post. This time I also followed Paige's example and found small embellishments to add around various parts of each letter - so much FUN! I'll be sharing more INSPIRATION from the new BPC classes as I continue to enjoy my free trial. Have you set up an account at BPC yet? What do you think of the new format? I just signed up for a free month. I'm hoping to start Text Tricks this weekend. It looks like there are plenty of inspiring ideas in Paige's Pages! Splendid use of all those buttons - the red ones really pop, and adding little things to the black ones works really well. Don't blame you not sorting that tyre yourself - there is no way on earth I could ever get the wheel nuts off, so tightly are they screwed on these days! 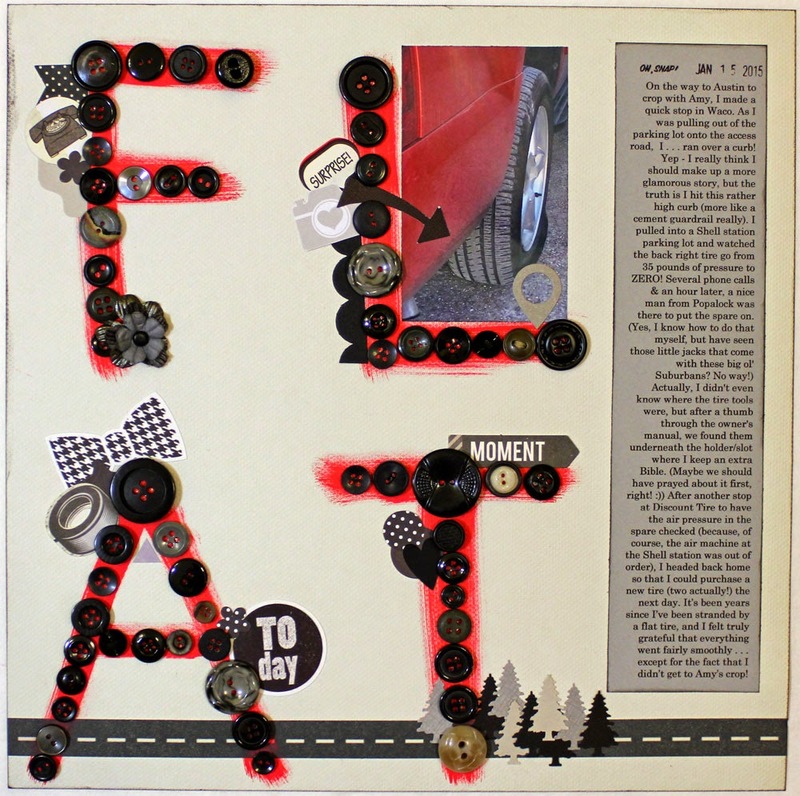 I love how you painted the letters "flat" and then used the buttons over the top. I guess I need to go check out the website. I love the way you've used the buttons Melissa. They just draw you right into the layouts! BPC? Hmm, I was a bit disappointed when they went to a membership site. I'm not sure if I can swing another monthly payment for online classes. I'll have to think on it some more. My free month already expired and I was honestly disappointed with the offerings - I cancelled. I'm also disappointed that there has been such limited communication about when & how we are supposed to be able to access our OLD BPC classes on the new site. On the other hand, I did sign up for a course on Cathy Zielski's site! Fun layouts! I love how the buttons for the words turned out! Shimelle once had a similar challenge; I think I used 20 brads. Neat pages and great use of the buttons and clusters for that title. I haven't been over to the new site and was surprised and disappointed to hear it was another membership site from my Mom. I went and looked, I've not signed up yet - due to lack of time.